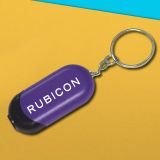 Custom keychain lights will allow you to light up your campaign and stand out in the crowd. 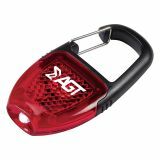 This keychain and flashlight combo almost becomes the integral part of daily life as people cannot do anything without their keys and lights. Your clients, customers and friends will be reminded about your business and services each time they use it for keys or lighting. 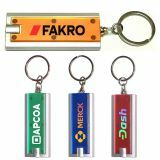 You can save on bulk orders of logo printed keychain flashlights. Save on online design proof, artwork assistance and efforts to show up in the intensive niche competition as their prices are included! 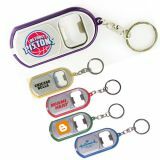 If you find promotional keychain flashlights at prices lower than ours, we will refund it by 10% on your next purchase. In all seriousness, everyone in your list should be equipped with a handy flashlight because you don’t know when they may need one to light up cramped spaces, find key holes in the dark or find missing items from the abyss of the purse. You can always keep your customers equipped for bad and dark days with any of our customized keychain lights. In today’s world it is quite obvious that most of your clients will be multitasking and you can help them by offering any of our best-selling keychain flashlights. These items will allow them to manage their keys and at the same time seek relief from darkness that has temporarily engulfed their eyes and senses. At ProImprint, we offer several different types of promotional flashlights and you can easily select from them depending on your requirement and budget. 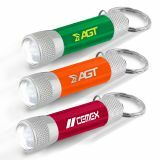 Whether you choose a simple aluminum flashlight, practical and safety minded whistle keychain light or solar powered keychain flashlights, they are going to buy appreciation for your brand logo and yourself. 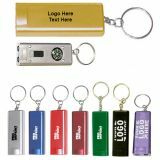 Logo printed promotional keychain flashlights make a great choice for bulk giveaways as they are affordable and compact sized .This combo item will light the way in your customer’s life to return favor to your business. We offer one of the highest discount margins in the niche. You can offer them as individual gifts or include them in tote bags. 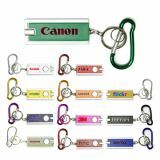 Also you can maximize the impact of promotions by offering these promotional keychain flashlights with other promotional products offered at ProImprint.